So sad to hear of the closure of one of the most prestigious concert halls closing. I first went there when it was a cinema to when I was a youngster, but in the 60’s I attended several concerts, ie. Sam & Dave, Tina Turner, Temptations, etc. and it was such a wonderful place to be. I haven’t been recently but it is sad to think that another venue is unable to compete with the out of town consortiums. Although I haven’t lived in Birmingham for many years, I do remember the Birmingham Odeon. I saw many films there including the first Bond film, Dr No in 1961 I think. But I do remember it as a wonderful concert venue and remember queuing round the block to buy tickets to see The Carpenters and James Last in the 70’s. I was surprised to hear that it still staged shows there with the N.E.C and other large venue in the area, but my memories remain. I remember standing outside the Odeon several times in the 60’s, and being stood up. Not a good place to meet, under those circumstances. The bright lights illuminating my shame and degradation, on display for all to witness. Yes Hazel, I saw the Walker Brothers and Englebert too. On the same bill were Cat Stevens and someone else called Jimi Hendrix! Everybody politely sat down in the begining but as soon as the band came on stage,, the bouncers lost control…. The wonderful thing about the Odean was it had a large stage, so if the singers danced, moved there was space…. Probably the best concert I’ve ever seen in my life was Zepellin at the Odeon circa 73/74…and the tickets were a quid!! Other great concerts I saw there were Purple, Sabbath, Rush, Lizzy, Gallagher, Nugent, Trower, Camel, Streetwalkers. A great venue which attracted all of the top bands in that era, and the acooustics seemed to be better than most other places in those days of pretty crap PA systems. Nugent’s sound was amazing….loud enough to make your ears bleed, but crystal clear! I was at the zepp concert too !! we queued all night to get the tickets. I still have the ticket but it doesnt have a year on it! Saw AC DC here. Thought the balcony was going to fall. Very loud and everyone stamping. Best night ever still makes me shake just thinking about it. Angus was carried around the theater on roadies shoulders. Touched his knee as he paased. What year sue? Did you see any Hells Ángels in the crowd? I was too young to go to gigs in those days, I remember looking in awe at the rockers queuing for Saxon in 1982, I was 10. I wanted to have long hair and patches on my denims! Perhaps someone will tell us the real reason it was closed as a concert venue. It was a second home to many 1000s of Brummies over the years. Must have been to 200 or more gigs there from Ritchie Blackmores Rainbow in 76 to the last one which was The Cult in 87 (I think). Don’t like walking past the place now as it brings back so many great memories and then you think why the did it have to stop? So many Brum folk will never experience how great it was to go to a gig at The Odeon.Very sad, but many many great nights and memories. Basically the N.E.C. I was Bar Manager in 85/86 and we were getting squeezed by the N.E.C. 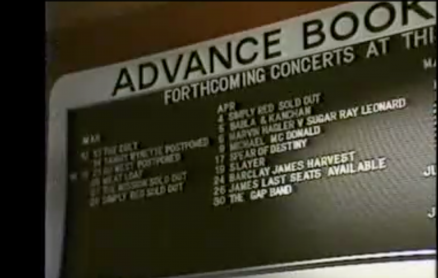 Even bands like Echo & Bunnymen used to do 3 sold out gigs. In ’88 did one at the N.E.C in ’88 selling less tickets, crap gig for that sort of band & they totally lost the following they had built up. Others not able to be considered for the NEC played at Wolverhampton Civic – not a bad venue but not exactly handy for people on the South side of Brum. I left when we heard about the multi-screed plans but I still miss a lot of the people.some of whom had been there for 20 or 30 years. Hi Stephen. I remember you pretty well. Not sure you will remember me? Dale, youngest of the Stage/Projection team. Worked with Ron, Slim, Ted, Derek & Bob. Happy days indeed. Check out my Facebook group ‘Birmingham Odeon Memorial’. I saw ramones, The Tourists, Human League, Steel Pulse, The Cure. Happy Days. As someone who organised many of the gigs at The Odeon, I was mortified to hear how bent some of the security were allowing people in at the back through the fire exit doors! Given the crap that we had to put up with, limiting the guest list on sold out shows etc, its amazing the disregard those, in so called authority, showed because of their greed! I left B’ham many years ago,but remember seeing some great gigs at the Odeon in my youth-loads of bands including Quo,Wishbone Ash,Roxy Music,Deep Purple,went to see the Boomtown Rats but my mate Kevin managed to get me kicked out as he kept pushing me forward! Met Bob Geldof after the show and got his autograph.Saw the Tubes twice,even saw Rod Stewart 27/11/74 only a few days after the bombs went off(40 years to the day,poignantly).Still come up to the LG Arena(saw Bryan Adams on 19/11/14) but the Odeon,along with the Town Hall were fantastic.Happy memories! love the news clip that managed to get so much wrong. Bev Bevan in The Who! Chris Mott was the manger not Chris Dodds. Did you write for musicians only and brum beat? better acoustics than the town hall which was hardly surprising – saw ray charles, the motown revue & the stones with the everly bros & bo diddley – the stones didn’t roll that well in those days. Little Richard, The Rattles and Mickie Most were on the same show as the Everly Brothers and Rolling Stones. Value for money! I was 13 and went to my first concert there on my own after traveling in on the 63 bus. I believe the bus fare was 2p then. I saw Thin Lizzy. Not only saw them, met them and they took me in to the concert as I didn’t have a ticket. I remember back in the 1980s seeing The Cramps live with Lux Interior, Poison Ivy and Co performing at the odeon I believe it was 1986 which was part of their i ‘A date with Elvis’ tour. Also at Deritend Birmingham I was lucky enough to see them again. Their music psychobilly punk was and always will be second to none. And as it’s a trip down memory lane for the old Birmingham, I don’t know if anyone can remember them, “Theatre of Hate”, at the Digbeth Civic Hall, Digbeth. So guys that is my youth in a nutshell. Please email me if you have any memories of this time. I went to these concerts with my friend John Morrow, who emigrated to Canada back in the late 1980s early 90s and unfortunately haven’t heard from him since, so if anyone knows anything that would be great. Just as an after thought if anyone have any memories they would like to share from the birmingham night scene from the 1980s it would be great to hear from you; places such as ‘The Brum Pub, ‘The Windsor’ and my favourite ‘The Perisian’; don’t hesitate to share a memory. I think I’m probably a bit older than most of you as I saw the Beatles there in 1965 or 1966, can’t remember exactly but I do remember my friend and I queueing all night for the tickets. Also saw Dave Dee etc and Jimi Hendrix. I remember him doing forward rolls whilst still playing his guitar! Saw so many films there over the years. So sad it’s gone. I remember queuing all night for tickets to see the Beatles. But the real memory was going to see Issac Hayes one afternoon. I had a seat at the front of the balcony and the place was empty, well the were only about 50 people there, the support act was Kilburn and the High Roads (Ian Dury before he formed The Blockheads) Always remember David Newton-Rohoman walking on with crutches. When they finished Issac Hayes walked on stage and look at us spread around the auditorium and said “Come on everyone come down the front”. We all made our way to the front of the stage and it was like a personal intimate show for just few people. I have to say having the full band/orchestra there with Issac doing Shaft and his other hit songs was outstanding. Seeing Fleetwood Mac there play to huge audiences, some what different to seeing the original Peter Green line up at Mothers. But it was a great place to see some of the all time great bands. Sad to hear that the Odeon is no more, the Compton Organ rising out of the floor at the front was great to see and hearing it played was wonderful, Toccata and Fugue was one of my favourite pieces. I only went to one concert at the Odean and that was to see the Animals. Eric still the beat white soul singer to have lived. I loved Otis and l do not mean Otis Ferry. I saw Harry Chappin, not long before he died. Also The Everly Brothers. They were great but only did about 30 minutes. Maybe they wern’! Talking again.. I remember well going to see ABBA in their only one concert they didn’t in Birmingham after they won Waterloo, my mate Roy Andrews was made on them and we sent for tickets 3 months before only to have our money returned and told there was no room left, on this my mate who knew all about ticket touts picked me up in his 3 wheeler mauve car and we headed of for town,, we parked on New Street Station and my mate Roy went and approached this old chap and paid him £10 for a £4 ABBA ticket, you wouldn’t get a pie for that these days!!!! He produced a ticket and I ran up to Roy and said where’s mine ? Don’t worry we’ll get you one and within 10 mins we had the matching ticket for £10 leaving me only £1_10p of my unemployent money but what a fantastic night !!!!!!! !